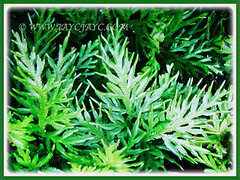 Asian Spikemoss or Cyperus Clubmoss is an exotic and ornamental shrubby fern. 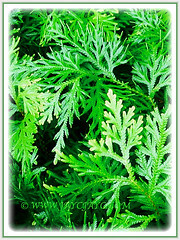 It is not a true fern although it produces spores but considered one of the fern allies in the genus Selaginella. A beautiful tropical plant that is listed as invasive by CABI. 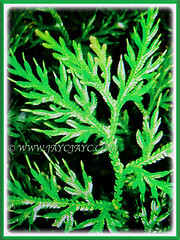 Botanical Name: Selaginella plana (syn. : Selaginella planum, Lycopodium planum). 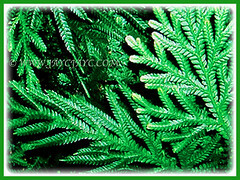 Common Names: Asian Spikemoss, Cyperus Clubmoss/Spikemoss, Paka Merak in Malay. 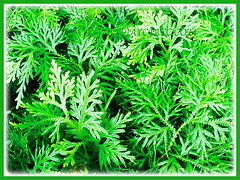 Etymology: The genus Selaginella is derived from the Latin word slago, meaning clubmoss. The species epithet plana means flat, referring to the flat plane of the fronds. Origin: Native to tropical East Africa including Tanzania, India, Indo-china and Indonesia. It widely cultivated elsewhere worldwide in the tropics and subtropics. 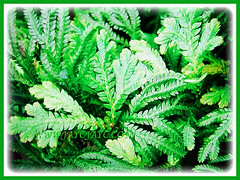 Features: Selaginella plana is from the genus Selaginella that comprises around 700 species of ferns. A moderate- to vigorous-growing plant that can reach between 0.2-0.6 m tall. It spreads out rather than up. This herbaceous and shrub-like tropical plant tends to grow upright until it becomes too heavy and then falls over. It is spread by underground creeping rhizomes. It produces small leaves resembling scales with two different sizes, that is, the smaller median leaves in the inner row and the larger lateral leaves in the outer row. The leaves are in various shades of green, scaly, coarse and tripinnate. The stems are long, wiry and branching, presenting a fluffy appearance to the plant. 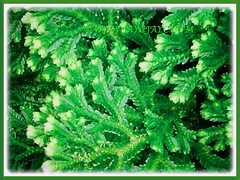 Selaginella plana is a heterosporous plant and reproduces sexually. It has distinct male and female spores known as microspores and megaspores respectively. The spores are produced on leaves in enclosures called sporangia. 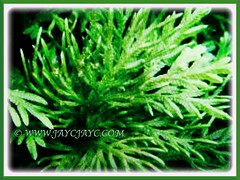 Culture (Care): Selaginella plana or Asian Spikemoss can be easily grown with least maintenance. Light: Full sun, filtered sunlight to partial shade. However, it prefers semi-shady conditions though able to tolerate full sun provided it’s given lots of water. Moisture: High water requirements. It requires constantly moist soils but never soggy. It needs high humidity and occasional misting. Others: Remove dead or damaged stems as soon as they appear. Pinch back the tips of the stems of Selaginella plana if it grows too tall or leggy. Pruning the plant encourages new growth and assist it to become bushier. 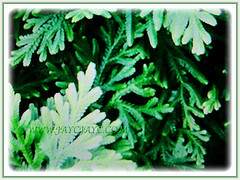 Selaginella plana or Cyperus Spikemoss is popularly cultivated worldwide in the tropics and subtropics. It is not tolerant of chill. Try to maintain a steady temperature for this plant. Best average room temperatures is 18-24°C. Protect the plant from cold drafts and wind. Place the plant in the garden during the warm months and bring indoors as a houseplant during the colder months. In the warmth of summer, keep the plant moist but reduce water in the winter. Use it as a groundcover among shaded rocks in frost-free regions or indoors in a terrarium or in a hanging basket. A warm greenhouse is ideal but protect from winds. It loves a high humid environment. Hence, use a humidifier to increase humidity if necessary or mist the foliage regularly with room-temperature water. Alternatively, you can stand the pot on a tray of wet pebbles. Feed monthly from spring through fall with a balanced liquid fertiliser diluted by half. Propagation: Easily propagated by stem cuttings, division or spores. 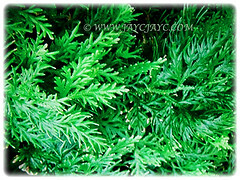 Usage: Selaginella plana or Cyperus Spikemoss with its ornamental foliage is excellent as a bushy ground cover that can be trimmed if needed. It is suited in terrariums, mixed containers and container planting. Very ideal in hanging baskets where it can expand and spill over the sides. Suitable as an indoor plant or houseplant as long as provided with high humidity. In some regions, it is traditionally used to treat bleeding, headache, fever, stomach aches, coughs, asthma, eczema, menstrual disorders and as postnatal tonics.